We live in a truly incredible time: music is more available than ever, everybody has access to it, and everybody enjoys it. Since music streaming came out, there's been so much music around that people are just confused with its quantity. There've been two major issues ever since: How to pick what to listen to? What about the quality? To solve the first one, people created playlists, online radios and personal recommendations, but they will never replace the intimacy of person-to-person interaction that we had every time we went to a record store. But again, the sound quality has been put on hold, and we must take some serious actions in this regard. Streaming bosses are currently Apple Music, Google Play Music, and Spotify, but it doesn't mean no other player can enter the market. So let's review two other services – Pandora vs. VOX Music Player – and compare them according to some criteria. Pandora is a streaming and recommendation service that works primarily as a personalized playlist generator. They call it 'radio' but de-facto it's a playlist service that automatically refreshes and adds new music to your playlist. When you first log in, you are asked to enter an artist, album, or song you like, and Pandora will instantly create a neverending playlist based on your initial choice. However, its functionality doesn't narrow down to radio only. 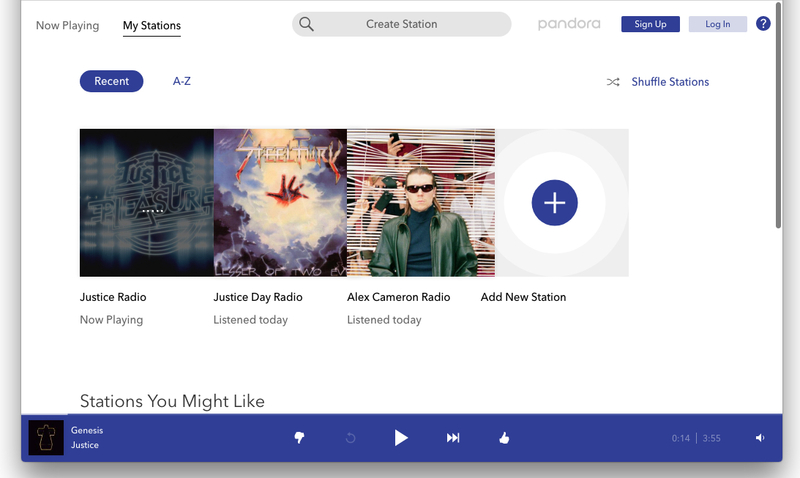 Let's take a closer look at Pandora Radio and what it has to offer. There are over 20 radio stations, including Top, Blues, Comedy and some others, which you can search by artist, track and composer, or choose from the Genre Stations. Although there are no lyrics for all the songs, it is cool to see the lyrics for most of those songs with full-length tracks. 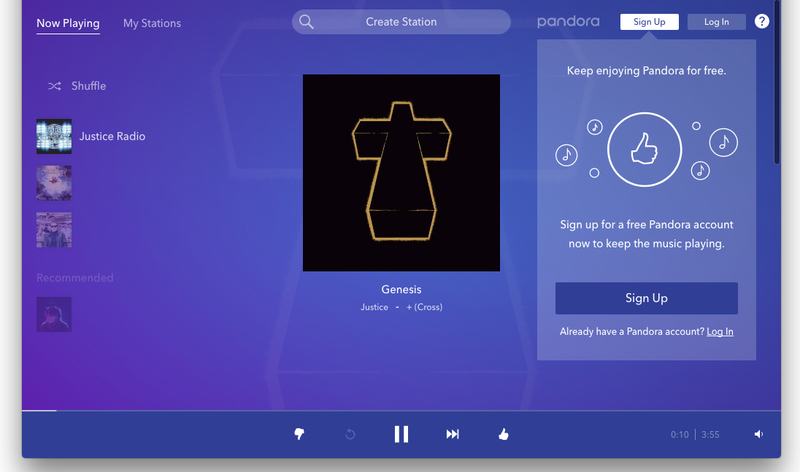 Besides browsers, Pandora is available for iOS, macOS, PC, Android, TVs, and cars. Their "Free" plan is Ad supported so if you're OK with listening to an Ad every few songs, then this is a no-brainer. You'll also still get access to the hundreds of stations they offer all for free. Unfortunately, Pandora is available only in the USA. So its either you're in America, or you use VPN. It used to be available in Australia and New Zealand, but in July they announced that the access to the service will cease. There's no option to download the songs that you like and add them to a personalized playlist of downloaded songs. If you find an artist that you like, you can't simply choose to listen to their entire album, you're limited to a playlist based off of the artist or song that you choose. There's virtually no visible information on new releases, charts or data, but buried within its metadata is information that skillfully matches tastes and picks good stuff. The most you'll learn about your new favorite song is who made it. 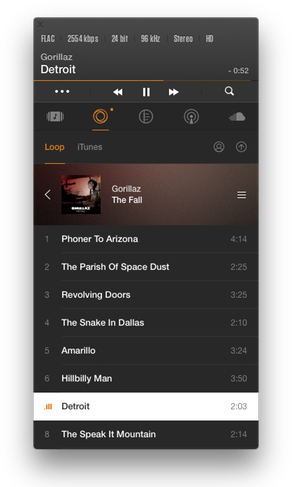 VOX Music Player is an audio player for Mac & iPhone that stores and plays all your music regardless of the files' format or size. Although I spoke about a streaming service before, I'm aiming to make a point why a Hi-Res audio player is better than any streaming service. VOX is also somehow a streaming player, with the only difference that you can listen only to tracks you upload. How is VOX different from other music apps? VOX Cloud Storage: You upload FLAC 4096 kbps/96kHZ – you listen to it. Download VOX Music Player, subscribe for VOX Premium and then upload your all the music you have into VOX Cloud Storage. After that, you can enjoy all your Hi-Res music library, anytime, anywhere. If you're bad at making playlists, you can sign into your SoundCloud account to stream from both sources of music. This is the key VOX feature because in 2017 Hi-Res audio has finally become a favorite in the music industry. We now pay more attention to the sound quality and not the quantity, and it's amazing. With VOX Cloud Storage, you can access your music library anytime and not question yourself if there will be enough iPhone storage. I have a truly enormous Hi-Res collection and whenever I want to find new music I go to SoundCloud and then stream it with VOX. More on SoundCloud below. The complete list is too long to outline here, but the popular audio formats are mentioned above. The only thing I can add is that I honestly doubt you can find a format VOX can't play. Hail to the quality. A truly remarkable feature. As you upload some music to VOX Cloud Storage, it becomes available on all your devices connected to your VOX account. That's how you listen to Hi-Res audio files on iPhone. Your iPhone will never produce such pure sound with any streaming service. This one is a vital feature. Why? Because no matter how immense your music collection is, you always want to discover new artists and genres. For that reason, VOX Music Player integrates with SoundCloud and Spotify so that you have access to their libraries. You can add any song or album from these streamings to your collection to create exclusive playlists. Also, you might want to sign in to Last.fm to keep your listening stats up-to-date. VOX works via the Internet data (3G, 4G, LTE) or Wi-Fi. But if you know you won't be having any connection, you can download songs or albums in advance to listen to them offline. The sound quality will remain the same, but remember that Hi-Res files take up much of iPhone's storage. VOX online radio unlocks when you subscribe to a Premium tier. Unlike many streamings, VOX broadcasts real radio stations. The list includes over 30,000 radio stations from all over the world. 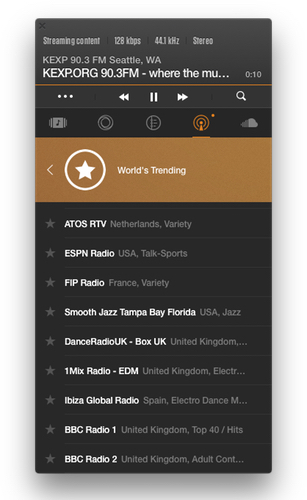 Unlike Pandora, VOX is available no matter where you are. It's a great solution, especially if you live outside the US. Both features aim to improve the overall sound. The Equalizer has over 20 presets for different genres, and BS2B makes the headphones sound as if it would be a studio environment. If you're still hesitating, try using the free VOX tier and see for yourself. It has some limitations regarding features, though. I should mention that it really takes some time to find and upload music to VOX Cloud Storage, but even if you have a 3 TB collection, you can upload everything you've got within a few hours. I managed to upload 5 GB of FLAC files in 7 mins. You can check our 10﻿﻿ ﻿Best Sources to Download Lossless Music. I personally believe that the future of the music industry lies in high-quality music, and for this reason, I prefer VOX Music Player. The main reason is that I appreciate the sound quality a lot, and now that I've uploaded hundreds of Hi-Res albums and have a SoundCloud account to discover new music, VOX Music Player is a great music app for me. It combined the best audio quality and a huge SoundCloud collection. Perfect.